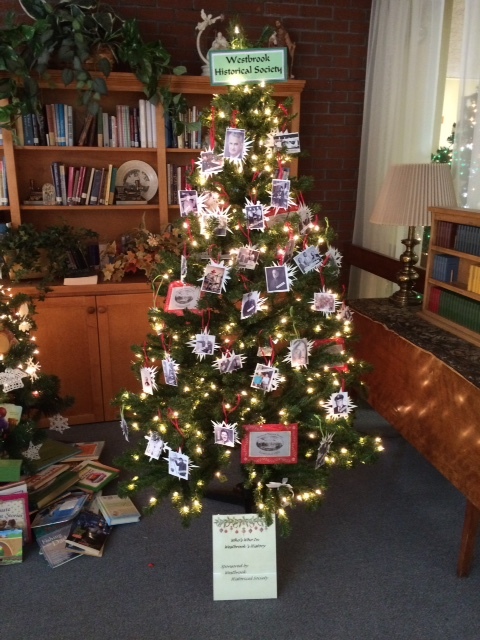 "WHO'S WHO IN WESTBROOK HISTORY"
This years entry into the Westbrook Festival of Trees salutes, and recalls, those persons who have shaped and made our City's history a great one. ‘Galveston Hotel’ under the management of Lashly & Reed, was an institution there and for a time the eastern settlement was the lusty rival of the western town [called Galveston].. The wharf building speculation proved a disastrous one for deacon Bailey, who, an old file of social paper says, did his Rival best; either at psalm, singing or selling groceries and he soon after left the island for a more congenial clime. In 1889-40 the Palmetto wharf, at the foot of Twenty-fourth street, was built by McKinney & Williams, and sealed the fate of Saccarapp, which began to decrease in population, and whose houses were moved to and helped to swell the proportions of the successful rival. According to the article above, in the 1800s some citizens of Saccarappa [Westbrook], ME traveled to, and settled on Galveston Island, TX. Although the settlement lasted only 10 – 15 years before people moved to the nearby community of Galveston, on the west side of Saccarapp, it is still remembered in the Galveston area. The Lafitte Society of Galveston has sent a query to the Society requesting any information it may have on the settlement. However, no information regarding this emigration can be found. If anyone has information, i.e. family history, or family stories regarding ancestors moving to Texas, please contact the Society. 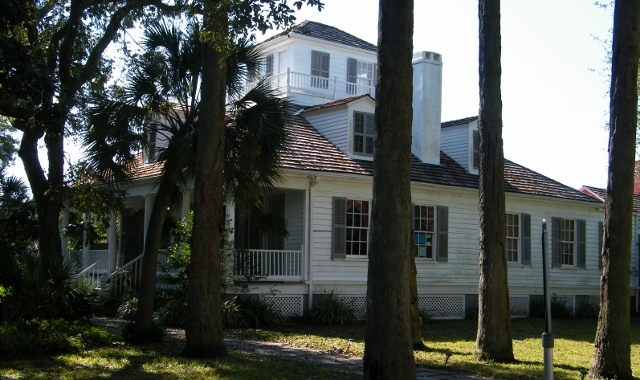 It is a 1.5-story house, topped with a cupola where Williams installed a telescope so that he could be one of the first to learn when interesting cargo arrived in the Gulf by ship. When Williams died in 1858, the house was sold to his friend Phillip C. Tucker and became known as the Tucker House. In 1953 the Tucker family sold the house to the newly organized Galveston Historic Foundation and it became their first project. They restored the house and used it as a museum for a time; it is now a private home. It is the 2nd oldest, still-standing, house in Galveston and is on the National Register of Historic Places. A house in Galveston, made in Westbrook! One of the purposes of a historical society is to act as a resource for people doing research, be it for genealogy, historical facts, school projects, or just for personal information. Usually we help find articles, references, etc. for them, and they leave. So it is especially great when the Society gets to see the fruits of their assistance. 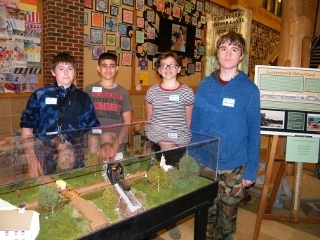 One of this year’s projects at the Westbrook Middle School was to research, study, and reconstruct the part of the Cumberland & Oxford Canal that transversed Westbrook. This was accomplished with the help of articles and books from the Historical Society’s reference library. 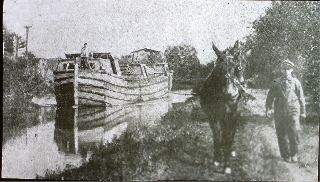 The students learned the route of the 20 mile, hand dug canal, which operated from 1830 to 1870. The canal ran through the Saccarappa area of Westbrook, along the westerly side of Stroudwater Street; (remnants of the canal can still be seen behind their school.) It ran through Beaver Pond and crossed over the far end of Conant Street, into Gorham. 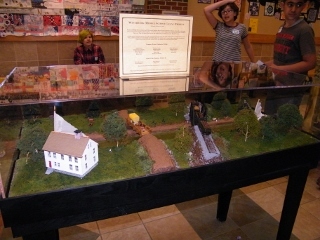 This replica of Westbrook’s western piece of the canal was reconstructed and built by the students. They also built to-scale replicas of many of the canal flat-bottom boats and even researched the boats' names. The large, beautifully constructed house in this diorama is the Wyer House on Longfellow Street which sat beside the canal. GREAT JOB STUDENTS AND TEACHERS!!! .....If you would like to learn more about the canal, you too can research it at the Society. Volunteers are always there to assist you. 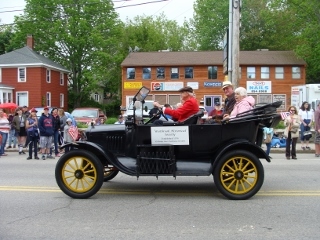 The Society participated in the 2017 Westbrook Together Days' parade on June 3, 2017. 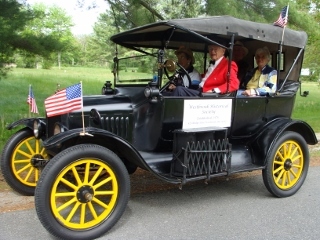 The antique car was driven by Nathan Brackett, passengers, in back seat, are Diane Dyer & Tom Clarke. Nancy and Phil Curran are well known and respected citizens of Westbrook. They have been active in every aspect of their city. In City government, he served as Councilman and State Senator and she was a long time School Committee member. Both are active in their church, The Prides Corner Congregational, where they help with the church suppers and Phil often helped out as lay minister. (The Society has a collection of the sermons he has given over the years.) Both are active in local organizations such as the Westbrook Woman’s Club (Nancy) and the American Legion (Phil). Phil is a WW II veteran. There are many more items of note, but the list is too long to research and list here. Nancy: served on the Publicity, Membership and Auditing Committees and served as President from 1997 to 2000, and Treasurer from 2000 to 2015. Phil: served on Museum, Finance, By-laws and Program Committees. He was the Newsletter Editor from 1997 to 2007 when he presented the Society with a notebook containing 10 years of his newsletters. It can be viewed at the Society library. Both have served and supported the ideals of the Westbrook Historical Society, and given freely of their time and knowledge. Thank you both! 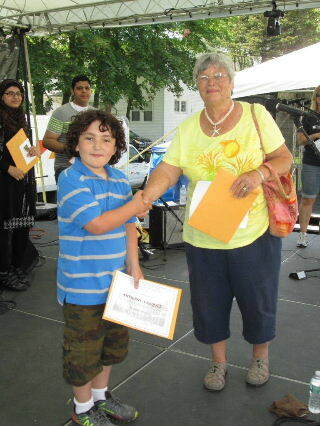 Winners of the 4th annual Westbrook History Contest were announced at the Westbrook Together Days on May 30, 2015. Winners receive a small monetary prize and a one year membership in the Historic la Society. Twenty-six years ago, a greater Portland group representing 14 local cities and towns, formed a Sister City relationship with Archangel, Russia. At the time of the initial conception, Westbrook’s Mayor Philip Spiller was head of the greater Portland organization that spearheaded the idea. Archangel is a city in the north of European Russia. It lies on the banks of the Northern Dvina River near the exit of the White Sea, and has numerous islands in its delta. It was a chief seaport in medieval Russia so its geography and history corresponds to ours. For the second time in recent years, a group of Archangel businesspeople visited the Westbrook Historical Society. [Mayor Spiller and family were avid historians and members of the Society.] Residents of Archangel and Greater Portland have visited back and forth since the formation of their relationship but an exchange last November in celebration of their quarter-century anniversary seems to have strengthened that tradition. The Russians visitors viewed a short slide show on local history and took a tour of the museum. The men were particularly interested in the military uniforms, the women enjoyed the quilt and the wedding gowns. All were especially surprised to see that we have three of Archangel’s newspapers that were donated by Councilman Mike Foley after his visit there last year. Pictures were taken by all and gifts exchanged. Each delegate received an Images of Westbrook book, autographed by our President Mike Sanphy who compiled the book. The Society received a commemorative Archangel coin, a Russian currency bill and a pen. These items and photos will be on display in the Society museum. A wonderful visit by all! This beautiful clock was a 2016 addition to our collection; gift from the City of Archangel, Russia. All the improvements were made from H. W. Foster survey, sidewalks, curbs, retaining wall, sewer. Congratulations to the winners and 'thank you' to all who took the time to preserve our past through stories of Westbrook life. Entries were submitted from Maine, Virginia, Arizona, Massachusetts and South Carolina. Westbrook history was related through stories about an unsolved murder and a mill accident resulting in death (both occurring in the 1880s), Dairy farming in 1920s, the lives of 2 Westbrook clothiers and various memories of life in Westbrook in 1940s & 50s. Visit the Society to see the new display highlighting Westbrook over the past 200 years: its businesses, mills, organizations, people and military history. 2013 History Contest entries were sent in from ME, AZ and VA. [There were no student entries.] The subject matter included memories of growing up in Westbrook, a trip to the local library, biographical sketches of Westbrook immigrants (Italian, Franco-Canadian and Danish) and a farm history. and Beth Paulsen-Olmstead, 1st place winner for 2nd year in a row! Judges for the contest were Roberta Morrill, Marion Broaddus and William O'Gara. Thanks to all. 2nd Place, Student: Morgan Rielly for his interview with "Arthur and Bill Currier"
Entries came from CA, FL, MI, ME and included subjects such as local businesses, families, childhood memories and history. Thanks to all who entered and helped make this a wonderful gift to our City! 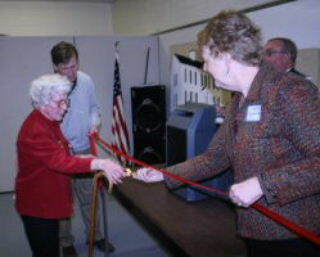 Mrs. Eleanor Conant Saunders, 91, a founding member of the Westbrook Historical Society, performs the ribbon-cutting ceremony for the Grand Opening of the Society's new quarters at the Westbrook Community Center. Mayor Colleen Hilton assists.The Society recently completed a move from the second floor of the American Legion building on the edge of Riverbank Park to the Fred C. Wescott building..
On Saturday June 3, 2010 the Westbrook Historical Society was proud to host a "Meet the Author and Book Signing" with our own member, Andrea Pacillo Vasquez as the honored guest. Containing a collection of Andrea's "History Matters" columns previously published in American Journal, along with never before published chapters, this book relates stories about historic Westbrook citizens. Books are now available at area book stores and at the Historical Society (see Gift Shop page). Cats, cows, coins, Westbrook artists, French Christmas decorations, bells, shoes (ceramic only! 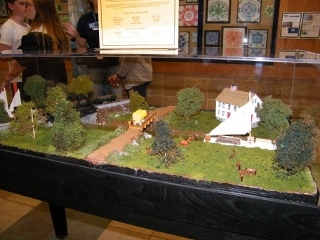 ), bells, thimbles, Avon bottles, bears and Civil War newspapers were some of the items displayed and discussed by the Society members when they took part in the program on Collecting, on October 7, 2009. It is wonderful to have outside speakers but it is also fun and informative...(the things we learn about our fellow members! )...to have programs which are totally presented by the membership! Mayor Chuluda welcomes Eleanor and Byron. He read the City Proclamation which named this date "Rudy Vallée Day" and rededicated the area as "Rudy Vallée Square". Eleanor addresses the audience, relates stories of Rudy's youth in Westbrook and unveils her gift to the City. The Mayor unveils the new signs. A new look for Rudy Vallée Square! A bust of Rudy is presented to the City by Eleanor (with the Mayor and Rudy's nephew William Vallée). 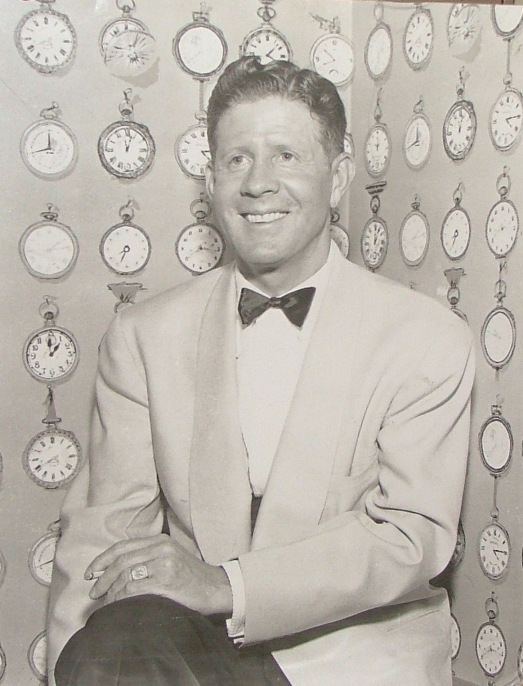 The Historical Society hosted a special Rudy Vallée Exhibit which was attended by close to 200 visitors. The main exhibit included a Rudy Vallée Christmas tree (as seen further down on the Activities page), 1920s vintage clothing, a Victoria with Rudy's records on display, the infamous megaphone and raccoon coat, a University of Maine pennant and photos of Rudy in his Navy uniform (age 15!) and in his Coast Guard uniform of WW II. The Vallée family was remembered in photos of the family and the family Pharmacy which stood in Vallée Square from 1910 - 1970. Yearbook clippings of Rudy (WHS 1920), sister Kathleen (WHS 1917) and brother William (WHS 1929) highlighted their scholastic careers. 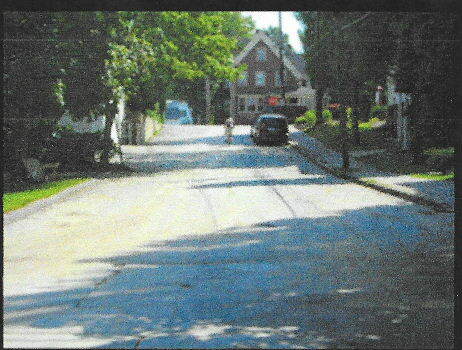 Both homes that the family lived in were shown...then and now. Kathleen is well remembered by many Westbrook residents who took piano lessons from her at the home on Monroe Ave. THE PHILIP LAVIOLET MILITARY COLLECTION was dedicated at the May meeting of the Society. Over forty people were in attendance to witness this event honoring life-long Westbrook resident, Philip LaViolet. Among those in attendance were Mayor Bruce Chuluda (who wore two hats as he is also Commander of American Legion Post #62), Commander Dana Staples and David Martin representing American Legion Post # 197, Mrs. Philip (Constance Meloche) LaViolet and their 2 daughters, and longtime friends Mr. & Mrs. Philip Mailhot (from the St. Hyacinth Historical Society which Phil LaViolet founded in 1988). Phil has put his heart and soul into preserving and updating this piece of Westbrook history for future generations. A reception honoring Phil followed the program. The Society and the City thanks you, Philip LaViolet! One of the favorite activities of the Westbrook Historical Society volunteers is to play host to our 3rd graders from Congin School. The students come to the museum before they start their course on Westbrook history. Volunteers show them the kitchen equipment that Grandmother used when she had to cook “from scratch” and bake on the wood stove. They learn about the Westbrook dairies that used to deliver milk in glass bottles to the door. They see how clothes were washed in the large wooden wash basin. Grandfather also worked hard, they learn, making nails by hand and cutting boards with small hand saws, all of which were on display and demonstrated by Society volunteers. School practices (such as sharing of books and the use of slate boards) and strict schoolroom etiquette and discipline are demonstrated. The children get to play with old time toys like Jacob’s Ladder, wooden clamp-on skates and pick-up-sticks. Each child leaves with a bag containing a home-made molasses cookie, a pencil and a pamphlet telling the history of Westbrook. Everyone has a grand time! The Westbrook Historical Society collected signatures for a petition to have a commemorative stamp honoring Westbrook's 'native' son Rudy Vallée, the first American crooner. Eleanor Vallée, Rudy's widow, started the process and asked for the Society's assistance. Hopefully somneday we'll see a stamp with his picture on it. It is always fascinating to see the great ideas that people use to work up a theme! The creativity is amazing, and it seems that no year is without a totally unique exhibit! A typical example is when our Boy Scouts decorated their tree (with knots they had tied) for a "Knotty Christmas." Speak about "creativity!" The Festival was established in 2001 by Patricia Elwell Wilson (Mrs. Robert Wilson) to honor the memory of her mother Beatrice M. Elwell. Businesses and organizations pay to sponsor and decorate a Christmas tree. Each tree must have a theme and the decorations must reflect that theme. The trees are then put on display at the Westbrook-Warren Congregational Church where the public may view them during a week long festivities. There are teas, a festival feast, breakfast with Santa, a sleigh ride and entertainment every evening. Most activities are free (except for the festival feast and a luncheon) and over $30,000 has been raised since the Festival’s start. All of this money is donated to charities that benefit Westbrook residents and to help finance Westbrook Together Days. Click HERE to access an archive of decorated Trees from previous years.